It recently dawned on me that Chicago Alphabet Soup had its sixth year anniversary earlier in April. What started out as text updates of restaurant excursions on my free Earthlink web space has now become a compendium of ethnic eateries throughout the Chicago metropolitan area on WordPress. That is what I call dedication. Others may call it a love of great food and I am the last person to argue with that observation. But today was not one of those days when I was reminiscing about starting the food blog. I was thinking about a certain restaurant in Oak Park, Illinois, that I passed on several occasions and wondered if it was worthy of a visit. Well, there was only one way to find out — just go! 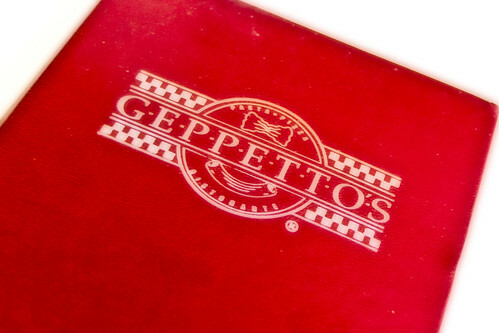 At 113 North Oak Park Avenue in Oak Park, Illinois, is Geppetto’s. Its fame comes from its pizza. Having a discriminating palate, pizza is not an item that has been high on my list of things to hanker for. After you have lived in New York City and have had their pizzas, especially a Brooklyn pizza that you have to fold in half, anything outside of that is cat food on wafers with cheese. Nevertheless, I found myself at Geppetto’s, greeted by a server who wore the face of someone who was ready to go home — or who was ready to leave work and go wherever. Full of empty seats — I could not resist — I had a seat close enough to the window where I could capture some nice impressions of whatever it was I planned to order. Having taken photos at a Greek restaurant the previous evening — Papaspiros — and seeing how they had done total injustice to the food that was so incredibly worthy, I loaded up my Canon cameras and was ready for action. I was not going to endure another moment of my Nikon cameras making me bark after watching my photos. Because it was a bit nippy outside, I wanted something to take the edge off of the chill. So, I had minestrone soup. Yes, it is so customary, but rarely is it botched and flares my snobbish sensibilities. 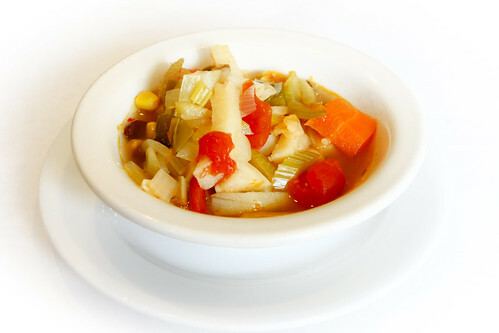 If I had a baguette, I could have enjoyed bottomless bowls of the minestrone this day. Nothing spectacular in how it was prepared other than it was just good soup with ingredients that harmoniously resulted in something satisfying to the palate. In addition to the minestrone, I had bruschetta pomodor. Thinking that there would be perhaps four pieces of bread topped with diced tomatoes, garlic, olive oil, and mozzarella cheese, I was fine placing the order. Then there were eight pieces of bread that came to the table and these were not small, bite size. Although not substantial, there still was quite a bit to tackle. 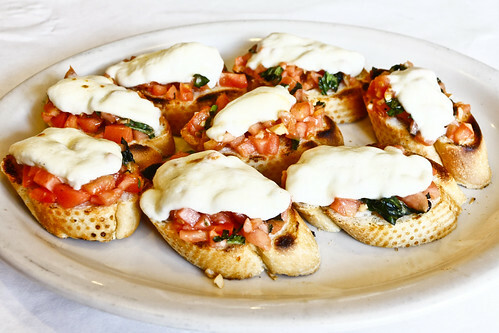 Honestly, the bruschetta pomodor was an appetizer and one that made me smile. The bread was grilled, indeed, and the tomatoes were plump with flavour, even though they were diced small. With a tall glass of cranberry juice at hand, I slowly worked all eight of those bruschetta pomodor slices to their vanishing point. I had a craving anyway and there simply was no need to leave anything so tasty for later. Then the seafood pasta that I had ordered came to the table. Oh my God! 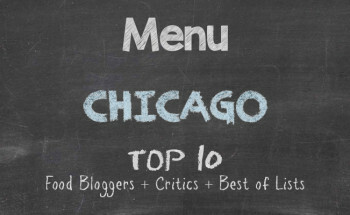 Truly Geppetto’s serves up everything the Chicago Way. It was large, colossal, Godzilla! 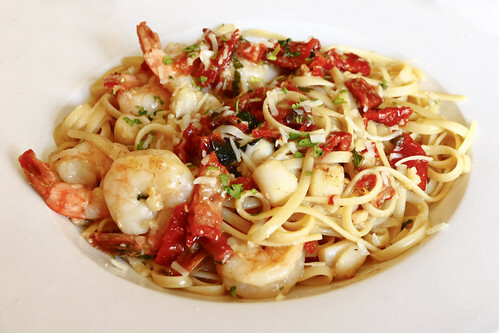 A huge plate of linguine with large shrimp, clams, and sun dried tomatoes begged me to get to working on it, taunting me and telling me that I needed to be stuffed. I obliged. For all the great flavour that the dish had, there was also a noticeable amount of salt that had been added. After being diagnosed with high blood pressure years ago, I eliminated salt from my diet and that pretty much was around the time that I had begun my entry into ethnic dining where the seasoning was an ideal substitute for sodium. Fast forward to the present and anything with too much salt almost gives the feeling of adding weight to my tongue. There was not going to be a case of me sending the dish back to the kitchen for modifications. Instead, I ate three-fourths of the seafood pasta and imbibed several glasses of water. The prices at Geppetto’s are a little higher than expected for a restaurant that does not have the associated pomp and flair. Then again, the portions are sizeable enough to defeat a burly lumberjack, so I stand corrected in my observation of the cost. The food compensates for the stoic service and good food is always a trump card at any restaurant or cafe. Geppetto’s is supposed to boast the best pizza around. I cannot say that I will add a calendar notification to test that assertion. However, there are several other dishes on the menu that I may indulge at some time in the future. In the meantime, I shall think of all the wonderful ethnic eateries that have left me rumpled and dreamy over the past six years.